Really wish I could, but as close as it comes to actually working, it just doesn't. Cauliflatkes. Get it? It's almost an apt word to describe Trader Joe's Cauliflower Pancakes. Almost. So close. It's caulifower. It's a wannabe potato pancake, which is more accurately a latke. 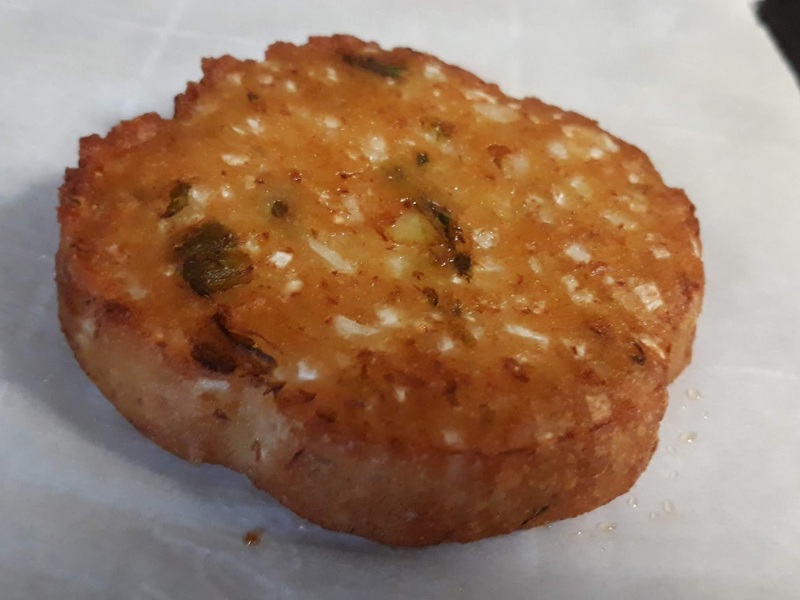 It's a cauilfower latke. But a cauliflatke? It just doesn't work. Which is too bad, as these cauliflower latkes are incredibly decent. It's nearly shocking. We all know by now how versatile cauliflower can be, and how well it can mimic rice and potatoes...still, let's be honest. You can usually tell if something is cauliflower. If it's not in the feel, it's in the taste. Kinda like how you can sense gluten free goods more times than not, or diet sodas. There's a distinctive differewnce more than times than not. File these wannabe spudders under "not." If I didn't know these were cauliflower, I would've assumed there were regular potato. The cakes are dense and heavy, with a lot of "build" to them. Granted, they do look a little different, as there's not toasty shredded bits of potatoes here and there, but eyes closed, not sure I'd tell the difference. Even when baked in the oven, as we did, there's a greasy crispiness that makes me wish we woulda deepfried them. I'll have to settle for the gratitude of my arteries. There's a small taste difference, though, but not due to base matter. Almost every latke I've ever had contained onions in them, and weren't shy about it. No onions here. Instead there's a small amount of Parmesan cheese used as flavor. It's not over the top, but could more paltable for the anti-onion crowd, whoever you are. Weirdos. Bake them, fry them, eat them straight, top with sour cream, serve with applesauce. Eat at dinner, at celebrations, as a party appetizer...heck even be weird like us and have them for breakfast. Nutritionally speaking, they're a black hole, but this time, less carbs, amirite? It's every bit a latke. 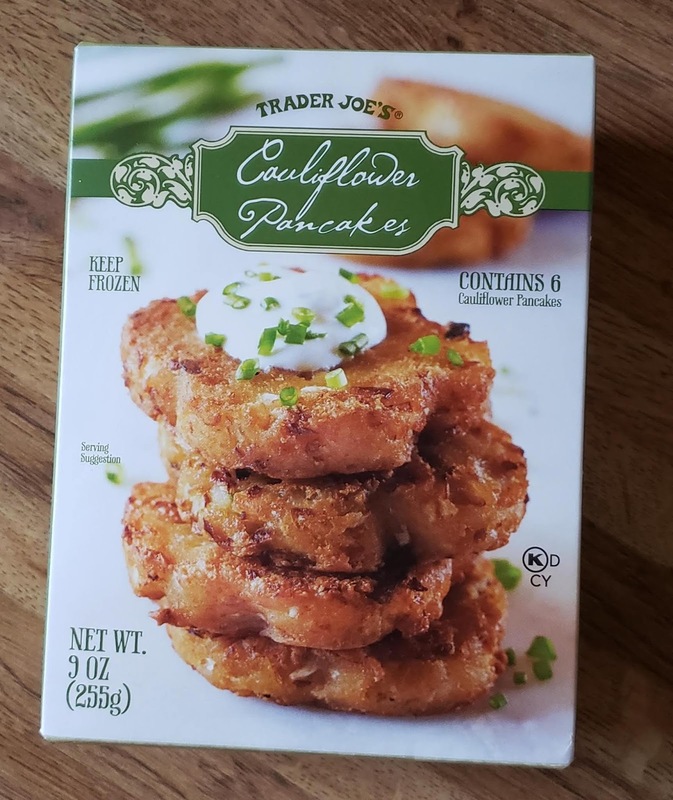 These TJ taterless cakes aren't labelled as gluten free but I'm not seeing anything indicated on the ingredients that would have me to expect they're not...correct me if I'm wrong please. You can't say the same about the regular TJ latkes. Small note: the box of six costs $3.99. That's one of those odd price points that screams neither screaming deal nor complete rip off, which probably means it's fair for all involved...but as much as I like them at $3.99, I'd like them even more at $2.99. Call them whatever you want. Maybe with enough support "cauliflatkes" could be a thing...but I'm not counting on it. Count this though: double fours. Weird that they aren’t low carb. Nutritionally they’re about the same carbs and fat as the potato latkes trader joe’s had last year! Haven’t looked for those lately so maybe they’re around too. I guess cauliflower = healthy so most people won’t notice that. Too bad about the parm because for those celebrating latkes are nondairy so they can be had in the same meal as meat- not so with these cauli ones.